Ms Laughlin began her teaching career at Horsham High School, specialising in English and History. After a position at Springvale Secondary College she moved into the significant position of ESL Coordinator at Dandenong High School. The challenge was immediate – 90% of students at Dandenong use English as their second language. 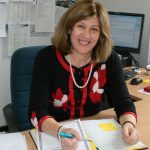 In 2007 Dandenong merged with two other local high schools, a $45 million project which Ms Laughlin co-directed in her new role of Assistant Principal. Along with the building development she was also responsible for creating a new curriculum and founding a school structure based on convergence and belonging. Providing direction and hope for a multi-cultural community was the basis of her achievement. She is equally determined to improve outcomes for all students at Camberwell High School and to empower them to take responsibility for their own learning. She holds a strong belief that the use and understanding of digital technology is a key to this goal. Pastoral care will continue to be a focus under her governance and apart from promotion of opportunities in sport, music and performance, she intends to create a greater emphasis on social awareness and community involvement. There will be a general enrichment of the whole educational experience and its outcomes. ‘Every student here will be made aware of his or her own potential and given every opportunity to achieve it’ declared Jill at her first school assembly as Principal. Ms Laughlin is passionate about ballet, contemporary dance and musical theatre. She loves cooking and eating and likes to venture to Asian countries to indulge in the local cuisine.